Continuing my newfound policy of actually reading comic books I’ve just bought rather than immediately filing them, here are my impressions of four out of seven editions I purchased at the 2017 New York Comic Con. Read about the first three HERE. Story: In “England Swings!,” American models Millie, Chili and Toni are in London, where a romance blossoms between Chili and Burton Chesney, a dashing Brit. Burton is a not-so-secret agent for the United Nations who lives at a medieval castle that is in disrepair. The girls decide to hold a benefit fashion show for the castle, to be played by the Gears, a quartet resembling the Beatles (though the drummer wears Austin Powers-style specs). Burton’s old-fashioned father objects, until — a spoiler follows — the Queen bestows MBEs upon the Beatles, proving that pop stars aren’t such pariahs after all. Talent: Stan Lee, editor; Stan Goldberg, artist; Denny O’Neil, writer. My thoughts: The story is sweet and funny and cute — and probably a skeleton in Denny O’Neil’s closet. But, hey, ya gotta start somewhere. The hipster talk and British-isms are forced and unintentionally hilarious. 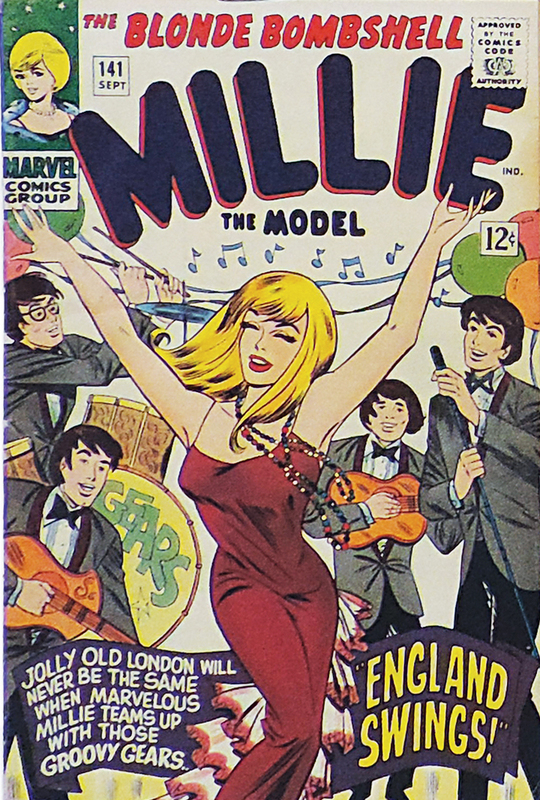 (Did anyone ever really say things like “It’s the great, groovy, gassy, back-flippin’ end!”) The “Overstreet Guide” won’t tell you this, but MarkVoger.com will: Millie the Model #141 has the first appearance of “London’s own” Jill Jerold, a (gasp!) black model. (In fact, I just went on the Google to see if there’s anything about Jill, and I got zippo. So this very post you’re reading is historic.) Did Jill go on to have a fabulous career in comics? All I know is that there’s a box that says, “Watch for Jill in future issues, gals! We think you’re going to love her!” And on the letters page, there’s a promise that Jill will return in the sister mag Modeling With Millie #48. Further investigation is necessary. Story: In “Super-Hope Meets Super-Hip,” Bob disguises himself as shape-shifting rocker Super-Hip, in order to make Tadwallader angry. (Bob does this on the advice of psychiatrist Dr. Frutekake, not realizing that Super-Hip is Tad’s alter-ego, and that Tad’s transformation into Super-Hip is triggered by … anger.) Meanwhile, Italian filmmaker Carlo Da Balogna wants to give his leading lady, voluptuous redhead Vava Vavoom, a new leading man: Super-Hip. There’s also the one-pager “It’s a Young World” with three gags by Mort Drucker, who looks like he’s trying to conceal his style. My thoughts: This book is positively manic, for better or worse. It’s got Drake’s usual Marx Brothers feel, though more story and less sight gags would have made for a better read. I’ve said it before: Nobody draws pretty women like Bob Oksner. Drake once told me that around this time, DC was planning to pull the plug on The Adventures of Bob Hope, but spin the expansive ensemble into a new book, possibly titled Super-Hip. That’s why Bob’s presence was noticeably shrinking in a title that bore his name. Story: “Badger’s Baby Brother — Beastley” puts Benedict Arnold High School’s resident bully, Badger, in an unusual role: as a sympathetic character. Badger turns to Tadwallader and the gang for help in disciplining his bratty sibling, who is back from military school (with the epaulets to prove it). 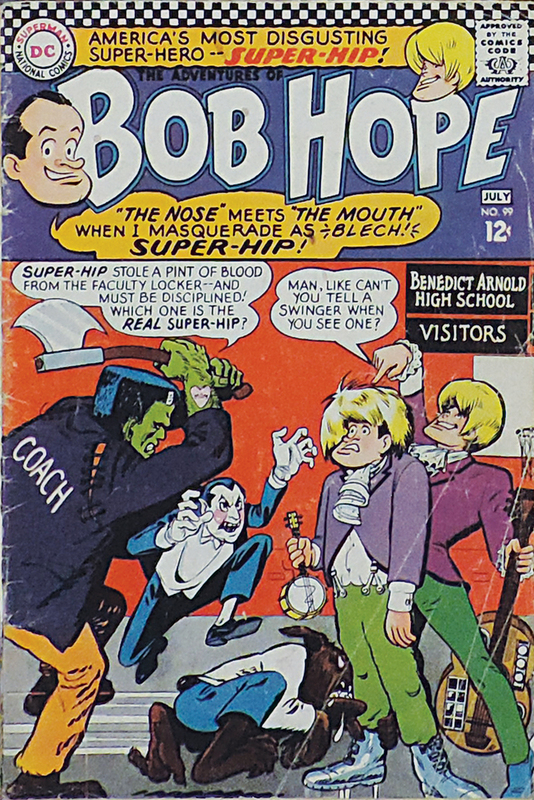 Meanwhile, the gang is gearing up for a softball game with the faculty (which, as regular Adventures of Bob Hope readers know, is comprised of monsters). Where’s Bob in all of this? He’s the umpire dressed in armor. 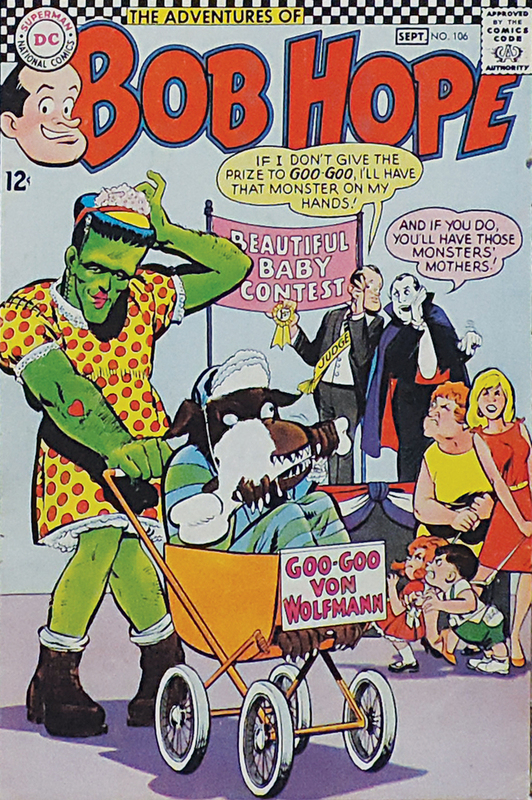 There’s also a beautiful baby contest, for which the Frankenstein-ian coach wears drag. Talent: Unspecified, but certainly Arnold Drake wrote it. As for the artwork, I wasn’t convinced that it was Bob Oksner. Maybe he did a rush job? Maybe he farmed out some penciling to a colleague? Maybe I’m not as eagle-eyed as I think? A bit of research on the Google turned up the (unlikely) penciler/inker/cover artist: Neal Adams (?). Adams was obviously imitating Oksner, especially when drawing the pretty gals. My thoughts: Fast-paced and madcap, this book has the same problem described in #99 above: the sight gags can be exhausting. (At least the books are consistent.) Still, I will never turn down a reasonably priced issue of The Adventures of Bob Hope by the fabulous Drake/Oksner team. Talent: Unspecified, but the story was illustrated by founding Martian Manhunter artist John Certa. My thoughts: People rag about Certa’s Dark Shadows art, but I’m in love with it, even as I admit his characters can be stiff and his inking a tad scratchy. Worst of all to Certa’s naysayers, his Barnabas Collins likeness is short of dead-on. 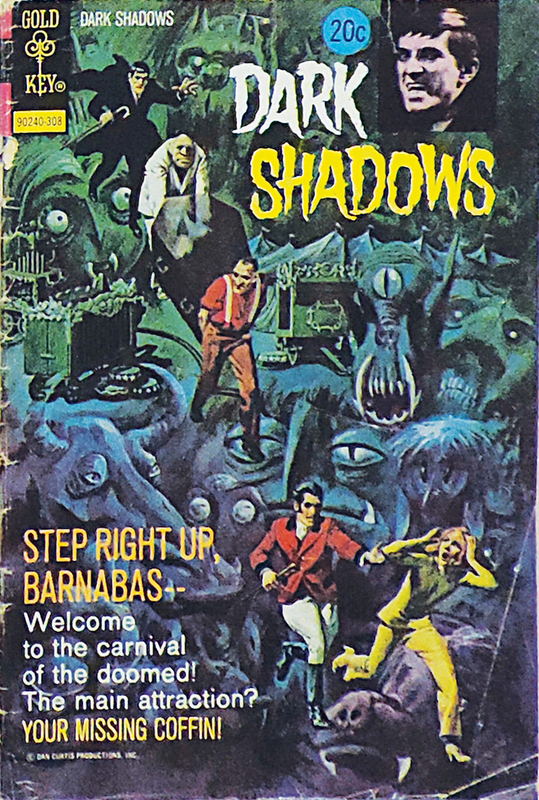 But I remember seeing Certa’s Dark Shadows artwork as a child, and I’ve forged a lifelong connection to it. (The same goes for Certa’s mid-’60s Martian Manhunter stories.) His work is atmospheric and he draws a mean Collinwood. Dark Shadows #21 is interesting in that it was published in 1973, two years after the TV serial “Dark Shadows” was canceled. The gorgeous painted cover, likely by the great George Wilson, depicts specific plot points and even one-off characters from the story.